A sign promoting abortive services has been widely criticized as being distasteful and overtly sexist. 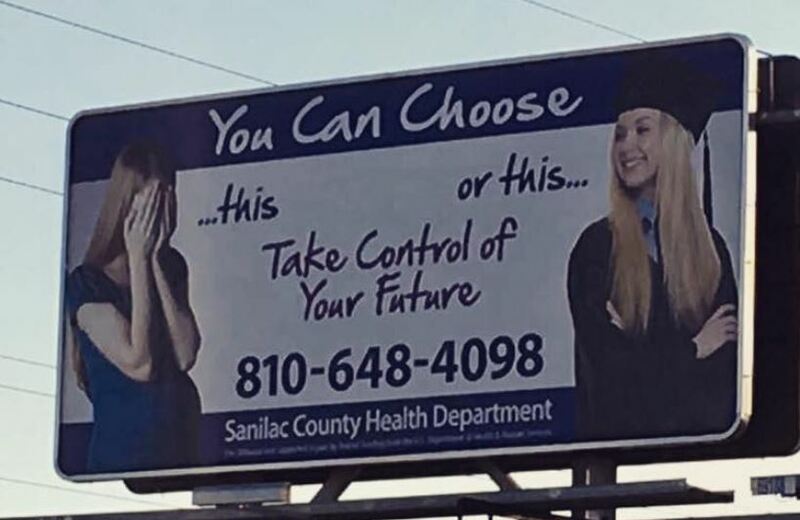 Advertising The Sanilac County Health Department in Michigan, the billboard depicts an accomplished and happy-looking college student, contrasted with a distressed and overwhelmed young pregnant lady. “You can choose… this or this…” the text ominously declares. Woah… WHAT!?!? Or how about women can do both? They don’t have to choose between their baby and being successful.Disturbing billboard put up by The Sanilac County Health Department in Michigan. The question has to be asked: why does a woman have to choose one or the other? The insinuation held within this simple and clumsy message is that women are simply not capable of dealing with the realities of having a child alongside having a career or being enrolled in school — an assertion that fundamentally sexist and, ironically, in wild contradiction to feminist ideals. Many social media users took issue with the offensive message being communicated by this distasteful advertisement. One person was so outraged by the billboard’s ghastly optic that she chose to phone the number and lodge a complaint. Upon receiving such fierce backlash, the Sanilac County Health Department quickly rushed to apologize. “We now realize, and apologize, that our original intent for the billboard was not correctly portrayed by its content,” the department stated on its website.